You would think that with how the 2018-2019 NHL season has played out for many (former) head coaches that New Jersey Devils general manager Ray Shero would have no problem terminating his bench boss. The Devils sit near the basement of the NHL's Eastern Conference as the All-Star Game approaches and the second half of the season really heats up. The race to the playoffs is on, and the Devils face an uphill battle to reach the post-season for the second time in two years. Ten points out of a playoff spot with 39 games played, a lot can change, but the Devils will need to dig deep to make it happen. This is usually when a GM would make a coaching change, bringing in a new voice to kick start his slumping team and, hopefully, get the club back into the playoff picture. Thankfully, John Hynes can count himself lucky to have a boss that's as patient as Mr. Shero. Having made the Stanley Cup playoffs last season for the first time since 2012, Devils aren't fretting about potentially missing the post-season. Instead, their focus is on continuing to build a culture and an identity, one that began with the hiring of Hynes in the summer of 2015. Hynes, formerly the head coach of the American Hockey League's Wilksbury-Scranton Penguins, has a record of 125-122-38 since taking over the Devils' bench. That's barely over a .500 winning percentage and usually a sign of a coach who is on his last legs with a club. But the Devils showed a great improvement under Hynes last year as they shocked the hockey world by beating out the Florida Panthers for the Eastern Conference's final playoff spot last season by a single point in the standings. In 2016-2017, the Devils managed a measly 28 wins, which was ten less than Hynes' first year in charge. But last season, in 2017-2018, the Devils went 44-29-9 and put up a fight against the Tampa Bay Lightning in the first round, succumbing to them in a 4-2 first round series that showed how much of a culture change the Devils have gone through. These are no longer the Devils of old, who were listless and lost since the retirement of Hall of Fame goaltender Martin Brodeur and seemed to have lost their luster of the early 2000s of consistently being a Stanley Cup contender. The New Jersey Devils are a team looking to build respect, year-after-year, in a league that is quick to forget about season's past and focuses heavily on the present season. Hynes runs hard-nosed practices. He pushes his players to be their bests. He stresses the importance of a strong work ethic and lets his veterans know that if a rookie takes charge and impresses the coaching staff, their jobs are for the taking. No one's role on the Devils is safe in this coach's mind, because like the rest of the league, his focus is on the current season and not resting his laurels on last year's surprising run to the playoffs. Its Hynes' guidance and mentorship that has the Devils starting to regain their lost respectability. Its all in the details he provides to his players, how he teaches them to grow, game after game, year after year. This is exactly why GM Shero has extended his bench boss to a new multi-year contract this afternoon on January 3rd, 2019. Shero constructed the Penguins club that reached the Stanley Cup Finals in 2008 and the one that hoisted the trophy in 2009. Shero patiently rebuilt the Penguins and is doing the same with these Devils. Shero, who knows Hynes from their days with the Pittsburgh Penguins organization, has defended his coach on several occasions when it seemed like the team's losing would never cease. Shero even raised eyebrows with his hiring of Hynes in 2015 as he was the youngest head coach in the league at the time. The honor now belongs to 37-year-old interm head coach Jeremy Collington of the Chicago Blackhawks. Shero did his bench boss a big favor when he acquired power forward Taylor Hall from the Edmonton Oilers on June 29th, 2016, a move that has even done wonders for Shero's own job. The Devils GM had previously been criticized for being too patient and not making a big enough splash, but silenced his critics with this acquisition and only having to give up defenseman Adam Larsson in the process. While Shero made the stellar transaction, its Hynes' coaching and influence that is responsible for Hall winning the Hart Trophy--the first Devils' player in franchise history to do so. Hall finished with 96 points last year, including 37 on the man advantage. While Hynes' coaching record thus far over four season's isn't all that impressive at first glance, its the details that this head coach brings to his practices and echoes to his players and how the club's recent progression that have the Devils brass confident that he's the man to continue to bring them back to respectability and continue to construct a winning culture in the Swamp. Hynes, having never won a Calder Cup while coaching in the AHL, did make the playoffs in each of his five seasons behind the Baby Penguins' bench posting an impressive record of 231-126-27 regular season record and never finishing lower than 3rd overall in the AHL's Eastern Conference. After being hired by the Devils, Hynes soon realized how much of a difference there is between the minors and the major league as his Devils struggled to find consistency and an identity in his first two seasons in the NHL. But a winning culture doesn't suddenly happen over night, nor does one player make it happen any sooner. 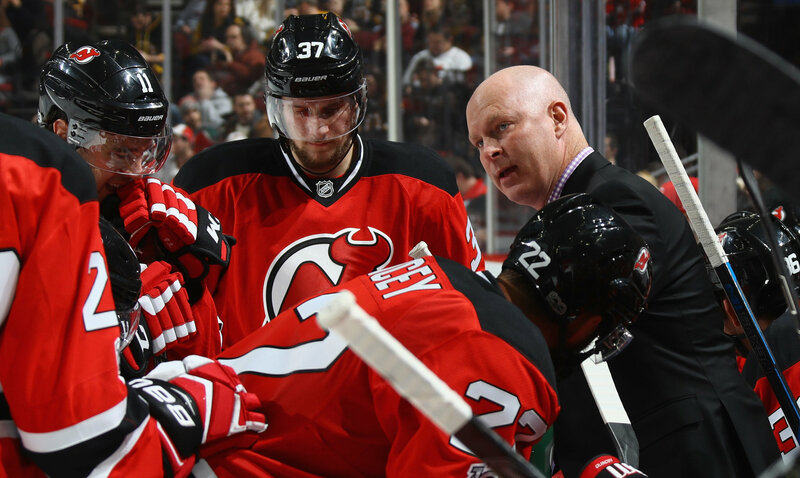 Building a consistent winner takes time, and patience, and fans of the Devils are starting to see their team coming out of the dwellers and back into the NHL's spotlight, courtesy of the game plan and culture Hynes has been preaching to his Devils since his first day on the job--and his players have nothing but the utmost respect for their coach because of it. In short, Hynes makes his team work hard and forces them to prove to him on a daily basis why they deserve to play for his team and why they deserve to represent the New Jersey Devils organization on the ice. This serves as motivation for every player in every position; the youngsters who are looking to earn a roster spot and the veterans who are looking to keep their jobs. This kind of healthy, internal competition breeds not only confidence and professionalism in its players, but is a building block towards the standards of success, and of what it means to be a Devil. In other words, this is the basis of the culture and identity Hynes has been constructing for the Devils organization for over four years now. Hard work and dedication to the details, that's how the Devils will start to win. Ray Shero's a believer, and the fans who pack the Prudential Center for home games are too. If only other GM's were this patient with their head coaches--and didn't get fired for sticking up for their guy behind the bench. But unlike the Philadelphia Flyers, the New Jersey Devils ownership group seem pleased with their dynamic duo of Shero and Hynes and likely plan on seeing what else these two can do in the season's to come. For now, with their coach extended, the Devils are focused on returning to the post-season. Winning games and continuing to learn from a head coach who pushes his players to perform to their highest standard, the Devils are on track to regain respectability sooner rather than later. In Hynes' sight, the club's well on their way to making this season as magical as last year. So keep your eye on these New Jersey Devils in the second half of the NHL season. They're a team that has plenty of fight left in them and are blessed to have a coach who keeps his players ready to battle, game in and game out.